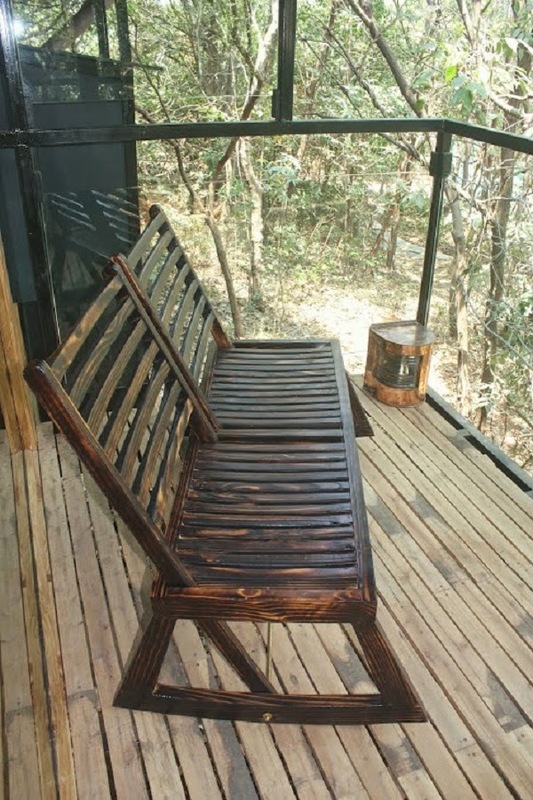 The Machan is located in scenic Jambulne, about 17 km from Lonavala. It is a 2.5 hour drive from Mumbai, and 1.5 hour drive from Pune. It is spread on 25 acres of land and 3300 feet above sea level. 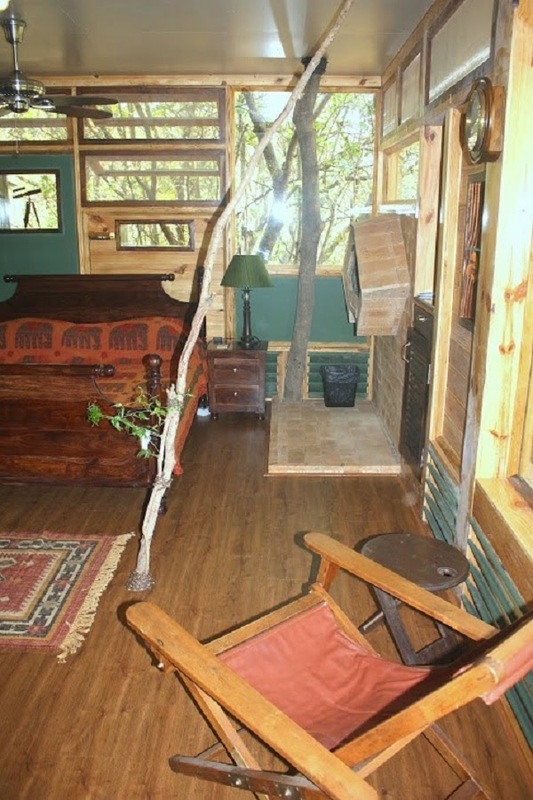 A short walk from the Reception through a thickly set forest grove you stumble upon our ground-based Cabins. 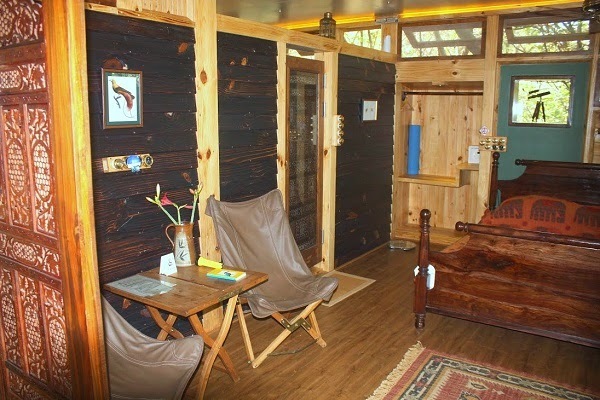 With only birds as neighbours in the Summers, frogs in the Monsoons and the wind in the Winters, the Cabins make for a quiet and peaceful retreat. 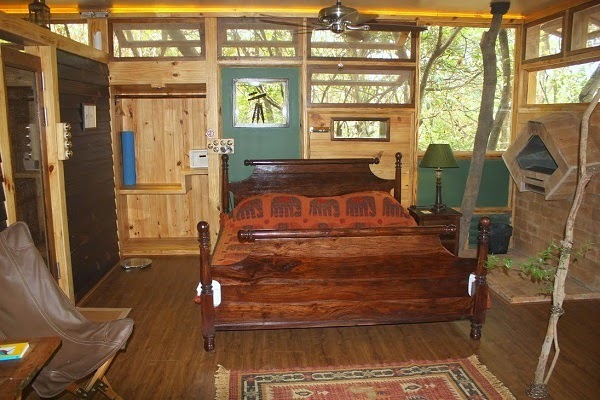 Nestled on the forest floor, beneath the Jungle Machans, our couples-only Cabins have three sections a) Master Bedroom b) Private Bathroom c) Wooden Deck. The Master Bedroom (15ft. x 20ft.) is spacious and tastefully decorated with hand-picked relics and artwork to create an authentic period feel. Even the solid brass light fixtures have been salvaged from ancient ships. Devoid of standard brick and mortar, the glass walls instil a feeling of being a part of the natural surroundings. On those especially cool nights, cosy up to your own romantic fireplace and let the natural sounds of the embers crackling lull you to a comfortable sleep. 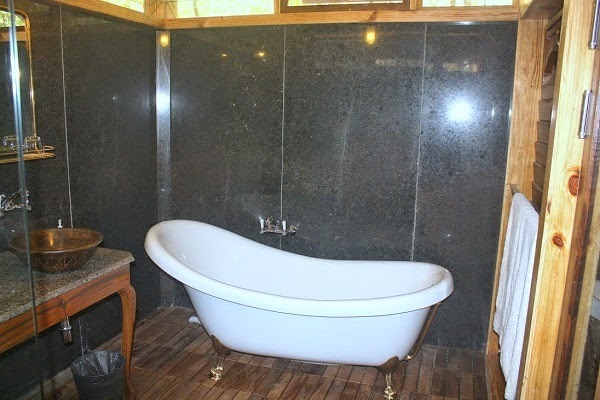 Attached to the master bedroom is a modern bathroom (8ft. x 12ft.). 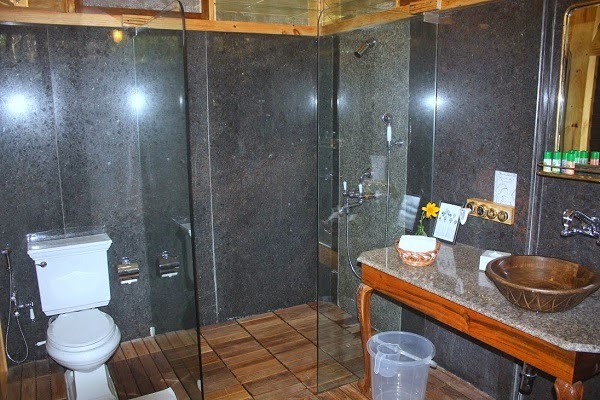 Complete with hot and cold running water & eco-friendly toiletries, this luxurious bathroom has hardwood teak floors, a standalone bathtub as well as a full glass shower cubicle. Extending outward from the master bedroom is a private Wooden Deck (7ft. x 10ft.) made from 100% recycled hardwood. We highly recommend spending your evenings sipping tea and listening to the sounds of the birds or watching the Malabar flying squirrel hopping branch-to-branch from the comfort of this private deck. This deck is sheltered, which offers guests a chance to sit out in the open during the day and enjoy the gentle breeze. Services include daily housekeeping (free of charge), morning newspaper (upon request) and in-room dining. For our guided evening nature trails & star gazing sessions, please get in touch with our 24-hour front desk. Check-In time is 14:00 hrs & Check-Out time is 11:00 hrs. Guests have the option to join us for Lunch and/or Dinner as well. Advance notice is required. Reservations desk is open to answer your questions from 10am to 6:30pm IST, Monday - Saturday. We are closed on Sundays.